Watch the fight of Miguel Angel Cotto of Puerto Rico vs Manny Pacquiao of the Philippines. This fight happened at MGM Grand, Las Vegas, Nevada, USA on November 14, 2009. In this fight Pacman really dominated knocking down Cotto in the 3rd round with Pacman right hand connects on the chin of Cotto. 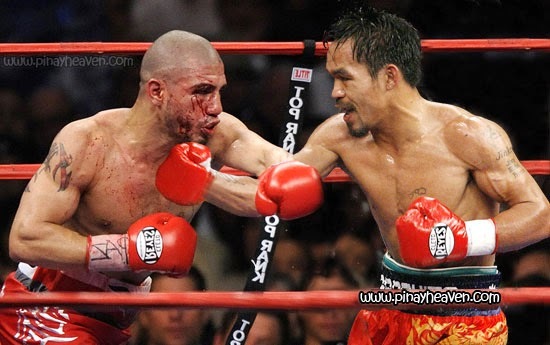 Then in the 4th round Pacquiao connects a left hook that knocks down again Cotto for the 2nd time. After that Pacquiao handled the fight, Cotto was really a punching bag that time. Speed of Pacquaio defeats the KO artist Cotto. In the 12th round Kenny Bayless stopped the fight at 0.55 minute mark of the fight. Kenny saw Cotto is no longer fighting and just running to survive the fight. Pacquiao won his 7th division title in this fight. This fight was one of the best fight of Manny Pacquiao. Demolishing and knocking out the one who has a strongest chin in the business.